Our bodies are 60-65% water. Thus the importance of the type of water we put into our body is obvious. Many of us today have access only to polluted water that will cause many health issues over time. Let’s not forget that our government actively practices water fluoridation of all public waters. The reason they do this is said to help with tooth decay, but many have said that fluoridation of water is for purposes of keeping our pineal gland calcified. The pineal gland resembles a pine cone and is located within the center of your brain. 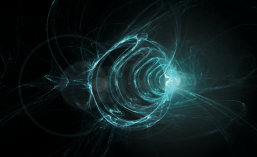 It is the source of intuition, discernment and extrasensory abilities. Drinking fluoridated water prevents the functioning of this important gland. It remains in a calcified state which is a poor receiver of higher energies. When we actively remove fluoride in our water it helps decalcify our pineal gland. Thus opening us up to higher energies. 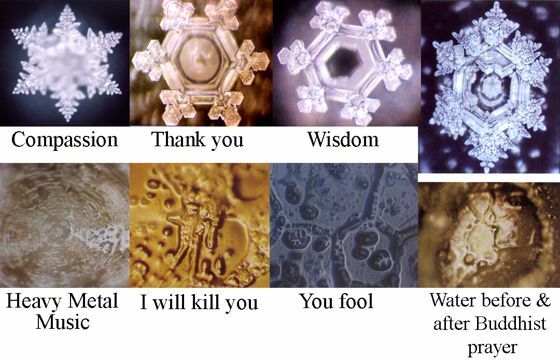 Dr. Masaru Emoto performed an experiment with water crystals that show how our thoughts and words affect water. Emoto’s experiment consisted of storing water in a sealed container, directing thoughts towards it and then freezing the water to see the patterns of the crystals. Dr. Emoto discovered that positive thoughts and words such as compassion, gratitude, wisdom and harmony created beautifully symmetric patterns. While thoughts of evil, heavy metals, I will kill you and you fool were very disharmonic patterns. As you can see not only does the purity of water affect our bodies, but also our thoughts as well. When we look at the situation here in America with all the negative news and media it becomes obvious that this stuff is the reason for many of our problems. We’re constantly being bombarded with negative messages in movies, media and on the internet. These negative messages affect our body just as much as the purity of the water we drink, if not perhaps more so. There are many ways that you can improve your overall health with water. One way to is drink only pure water. You can get yourself a reverse osmosis water filtration system or even a water ionizer. Some experts have even suggested that you use both a reverse osmosis water system and a water ionizer. You use the Reverse Osmosis to remove any impurities such as fluoride and then use the ionizer to re-imbue the water with minerals. As you can see the importance of knowing what you put into your body is crucial. There are various ways to improve your health with water. The article below about copper containers for water speaks of volume in removing harmful microbes in your water. The way I would incorporate copper vessels to first send water through reverse osmosis system and then re-ionize the water to make it alkaline and store it in copper vessel overnight. I’m going to give that a shot one of these days :D.
That would cover the purification aspect of the water, but we need to be aware of our thoughts as well too. The way we think affects us. Think positively and you’ll increase the effectiveness of the water. Praying to the water, directing positive thoughts and words towards it helps too. Both praying and purifying the water would benefit one tremendously. So don’t forget to pray and be thankful for water because it truly is something worthy of being grateful for. During my childhood days I remember my mother storing water in a copper vessel and asking us to drink it after 7-8 hours. She claimed that water when stored in a copper vessel was extremely healthy for the mind and body. Now when I see these ancient customs reemerging, I look back and think, I should have taken my mom’s advice seriously. Ayurvedic texts recommend drinking water stored in copper, because copper is believed to have anti-microbial, antioxidant, anti-carcinogenic and anti-inflammatory properties. It’s an essential mineral for our body and medical studies have proved the benefits of drinking water stored in copper jugs. Another study found that copper surfaces killed 97% of hospital ICU bacteria that can cause infections, resulting in 40% decrease in the infection rates. While another very interesting research was conducted to check, if wearing a copper bracelet has a placebo effect on arthritis patients. The researchers came to a conclusion that wearing a copper bracelet on your wrist or ankle can have a therapeutic value. Ayurveda texts suggests that water stored in a copper vessel has the ability to balance all the three doshas in your body (vata, kapha and pitta). Doshas is a Sanskrit word meaning ‘mind-body constitution’ and all three doshas are present in every cell, tissue, and organ – for movement, metabolism, and fluidity – are essential components of our life. Drinking a glass of water from a copper vessel (at room temperature) flushes the kidneys and the gastrointestinal tract. Copper is a good tonic for the liver, spleen, and lymphatic system. You simply need to pour water in a jug, keep it overnight and drink the positively charged water early morning or 2-3 times in a day – that is more than enough to reap its benefits. Don’t refrigerate that water. Wash the copper pot regularly with fresh lemon or a paste made out of salt and tamarind. In this modern age, we often choose convenience over a healthier living – drinking bottled water for example is not only harmful for the environment but also pose health risks. Isn’t it better to follow this old practice instead? Bhavika is a nature-loving, spiritual being and co-founder of Fractal Enlightenment, who strives to help fellow beings re-connect with nature and their inner selves. Thank you for being part of this journey.